Be sure to track your errors. One of the most common mistakes that GMAT test takers make when preparing for the GMAT is not spending time to track their performance on practice problems and tests. It’s absolutely critical to keep a log of your errors in order to determine your strengths and weaknesses.Think of it as data collection: this will allow you to tailor your GMAT prep to ensure to focus on the specific subjects where you need the most help. The Beat The GMAT Staff has developed these FREE custom error logs to help you in your GMAT studies. 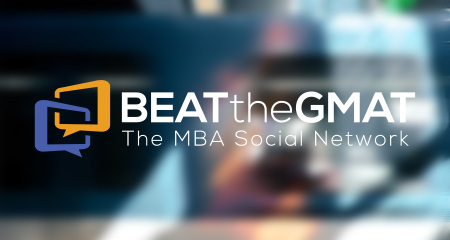 You must be logged into your Beat The GMAT user account to download these files. Login now or register an account. If you have any comments or feedback about these free resources, please ask in this forum. We’ll try to respond as quickly as possible! Description: This Mistake Tracker is one of the keys to scoring at a significantly higher level. This free tool will help you define exactly WHY you’re getting questions wrong (rather than a mere count of the content areas you missed the most questions in). By defining your error types, you can learn how to eliminate the mistakes from your work and hone your skill to generate the missing points you’re looking for. Input your results, question-by-question, into the Mistake Tracker Tool. Look at your top 3 tactical mistakes mistakes carefully. Fixing the underlying sources of these mistakes is a key driver of score improvement. Read the specific advice in the “How to Fix Mistake Sources” tab extremely carefully, and be ready to start deploying it immediately. Rework questions and assignments as noted. Remember, you’re looking to build new skills and eliminate little mistakes and quirks from your work. That mending process requires that you commit to CHANGING your habits, and reworking the questions you missed is by far the most powerful way to do so. By repeating this process after each CAT and quiz, you will be ready to perform at your highest level on Test Day. Description: Custom error log built for tracking your practice using the Official Guide for GMAT Review (2018 Edition, 2017 Edition or 2016 Edition). Track your performance across all categories of test questions: Problem Solving, Data Sufficiency, Reading Comprehension, Critical Reasoning, Sentence Correction, and Integrated Reasoning. Includes custom built reports to analyze your performance, as well as a comprehensive answer key. Description: Simple spreadsheet to record and track your GMAT practice test scores over the course of your prep. This spreadsheet is meant to complement The 60-Day GMAT Study Guide. Description: A must-download resource to supplement your regular GMAT practice problem sets. 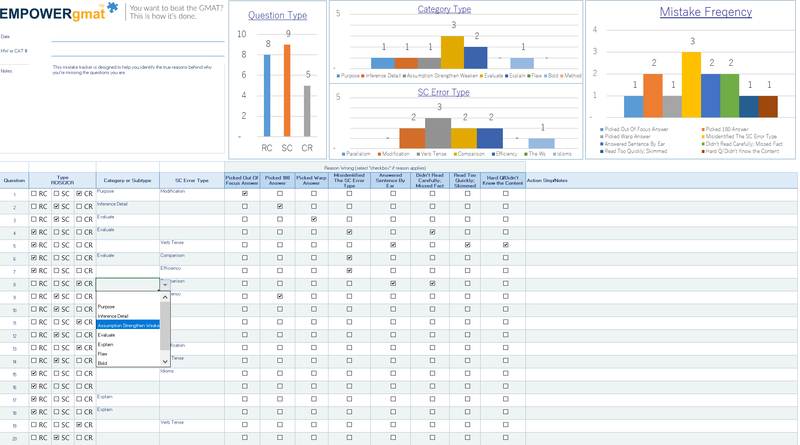 Track your answers, error type, how you felt, and notes for each question. A handy color-code system allows you to visually see how well you’ve performed in your practice. Description: Custom error log built for tracking your Official Guide for GMAT Review, 12th Edition practice. Track your performance across five categories of test questions: Problem Solving, Data Sufficiency, Reading Comprehension, Critical Reasoning, and Sentence Correction. Includes custom built reports to analyze your performance, as well as a comprehensive answer key.